Since I have yet to visit Ecuador’s coast, this fisheries post will focus on my consumption of seafood here in Quito, where I’m studying Spanish. Seafood restaurants abound in this Andean city despite its distance from the Pacific coast (about a 5-hour drive down to sea level, I am told.) To date, I have sampled spicy garlic shrimp (camarones a la diabla), fried sea bass and shrimp in coconut sauce (corvina frita y encocado de camarones), and mahi-mahi (dorado) in a plantain sauce. Each heaping dish was worthy of at least four stars for taste, but likely fewer for sustainability. A brief study of these three fisheries (mahi-mahi, sea bass and shrimp) raises some red flags. For starters, the United Nations Food and Agricultural Organization reports there is little scientific information and no effective management plans for Ecuador’s mahi-mahi and sea bass species, which are imported by the United States and other countries. An artisanal fleet uses longlines to catch these fish along the country’s 1,400-mile coast and in deeper, offshore waters. Rules governing the mahi-mahi fishery are not well enforced, according to FishSource, a database of global fisheries research. Environmental advocacy groups, such as the Monterey Bay Aquarium, warn that unregulated longlining can injure or kill sea turtles, sharks, seabirds and marine mammals that are unintentionally caught or entangled in fishing gear. Some Ecuadorian fishermen are experimenting with special hooks designed to limit the incidental catch of sea turtles. Shrimp farming in Ecuador has led to the deforestation of 70 percent of the country’s coastal mangrove swamps, said Cecilia Cherrez of Accion Ecologica Ecuador, an environmental group. Mangroves provide an important habitat for young fish, shellfish and birds. Huge tracts of mangrove forests were cut down to create massive shrimp farms that have polluted the environment and displaced local fishermen. In the mid-1980s, Ecuador was the largest shrimp exporter in the world. In the late 1990s, the environmental groups Greenpeace and Fundecol led a campaign protesting the expansion of shrimp farming in Ecuador’s northern coast. More recently, private and public stakeholders have been working together to reduce the industry’s environmental impacts. Some companies are now certified as organic shrimp farms. The Monterey Bay Aquarium in California publishes a seafood guide, called Seafood WATCH, which helps consumers choose seafood that is caught or farmed in ways that do not harm the environment. The guide advises U.S. seafood consumers to avoid imported, farmed shrimp in addition to imported mahi-mahi caught with longlines. Sustainable seafood guides have yet to reach consumers in Ecuador, says nutritionist Michelle O. Fried, who writes and teaches about Andean cuisine here. While fish and shellfish provide an important source of protein, more education is needed to inform consumers about their seafood choices. “Nobody is aware at all,” Fried said. 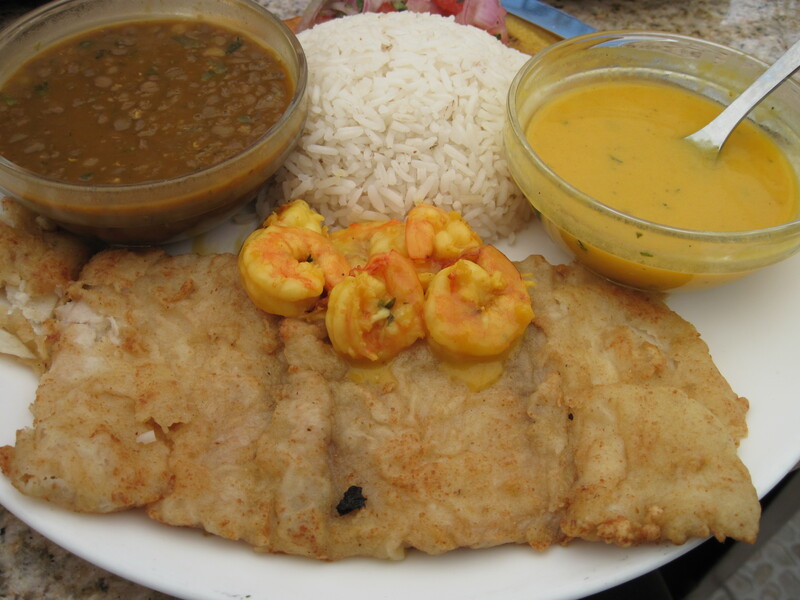 A recent meal of fried sea bass, lentils, rice, and shrimp in coconut sauce. Fish and shrimp at the market. One of four seafood stalls at a Quito market.